Many kids today understand multiple meanings of words like Triangle, Bridge, Plow, and Fish-a new language describing yoga, a mind-body practice that lots of kids are now exposed to, even in preschool. Known for such famous students as Helen Hunt, Raquel Welch, and NFL football stars, and for his two best-selling yoga books, Journey into Power and 40 Days to Personal Revolution*, the author approaches this new book from one of his favorite roles-a parent to his three sons. The playful presentation of poses is wrapped by a two-page introduction and three-page tip section. It reads like a yoga class. Baptiste, like his boys, was raised by yoga teachers and he talks to parents about how kids learn through imitation. It’s an invitation for parents and kids to practice yoga together. In the book’s yoga class, the students are invited to say what jobs their parents do. Each described career inspires a connected yoga pose from the narrator’s daddy: “Sita says that her mommy is a marine biologist. Sometimes, my daddy’s a fish.” The accompanying pages explain and illustrate the Fish pose. A gardener becomes Tree; a veterinarian, Dog; an architect, Triangle; a builder, Bridge. The connection between the job and the poses is a wonderful way to show the shapes of yoga in daily life. 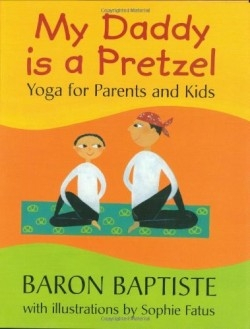 When referring to “my daddy” who does the yoga, the book is unclear; it might have read better if Baptiste had just admitted that he is that daddy. The illustrator, a French professional artist living in Italy, has won awards for her vivid use of color and shape; her three-dimensional works are on display at the Musée du Cirque in Paris. Here, her colors are cheerfully bright enough to engage kids, and her palate of rich hues is pleasing to adult eyes. She has illustrated several previous children’s books, including The Story Tree, Babushka, and The Barefoot Book of Monsters! Baptiste loves sharing yoga. He believes in the practice’s power to change people of any age. He encourages readers to think about how the postures affect them mentally and emotionally as well as physically; for instance, he suggests using the lion pose to boost courage. Readers will be hard-pressed to read this book without putting it down to try the airplane pose. Baptiste, who is a pretzel during much of his day, will think that’s just fine.